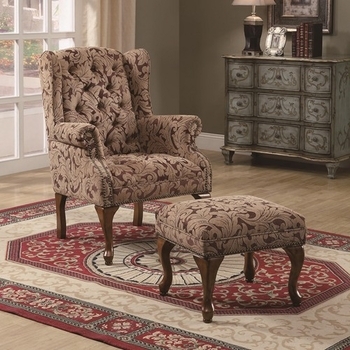 Create a sophisticated traditional style in your living room or family room with this elegant chair and ottoman combo. 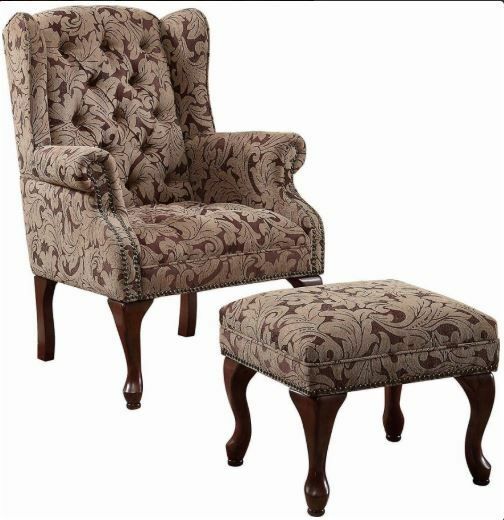 The high button tufted wing back, classic rolled arms with nail head trim, and high cappuccino finished cabriole legs create the ultimate traditional look. The matching rectangular ottoman offers a cozy spot to rest your feet, perfect for sitting back and relaxing while reading a book or watching TV. Covered in warm tan microfiber or neutral leafy fabric, this chair and ottoman are sure to complement your home decor.